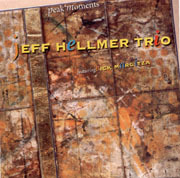 Jeff Hellmer brings a wealth of experience as an educator, conductor, and performer to his recent CD, "Peak Moments". Recorded with UT jazz faculty members John Fremgen and A.D. Mannion, "Peak Moments" features tenor saxophonist Rick Margitza. Hellmer's accolades include performing a concert with the Dallas Wind Symphony as soloist, conductor, and arranger of the entire evening's music. Twice named a finalist in the Great American Jazz Piano Competition, he has performed, taught and adjudicated jazz throughout the United States as well as in Russia and Taiwan. Under his direction, the UT Jazz Orchestra was selected to perform at the 1997 IAJE Convention, and his jazz piano students have garnered impressive awards, including selection for university positions and the Thelonious Monk Institute Jazz Combo. He has twice been a soloist with the Dallas Wind Symphony, and recently recorded with classical saxophonist Harvey Pittel. He is a co-author of the highly acclaimed textbook Jazz Theory and Practice, and his compositions for jazz ensemble are available through UNC Press, Concept Music, and C.L. Barnhouse Co.